I need a tool for crushing or mashing fresh tomatoes. I know I can use a grater but that takes too much table space for me to use and it's not comfortable enough - if you want to crush a tomato after you start eating, you need space for another plate to grate the tomato on top of it. You also have to stand up. 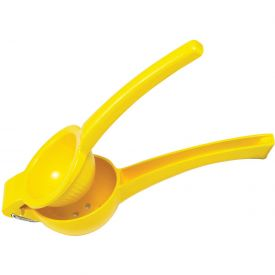 I am looking for a tool similar with an egg slicer, where you can simply push one side on top of the other to crush the tomato. Or like a nut cracker, so I can crush the tomato while holding it on top of my plate. And I can sit down when doing it. Is there any instrument like that? You would want to buy one in person so you can see the size of the holes, which vary a lot. I think some of the tomato would come out through the holes and some would be left behind mushed up in the squeezer, which you could shake out onto the plate. You could also try a food mill. They are a little bigger then a ricer but if you use a larger plate in it you'll get slightly bigger chunks of tomato. The ability to do this while seated makes most tools unsuitable. If you're only going to be using relatively small tomatoes (heirloom plum tomatoes), I would use a nut chopper. Not the grinder style, but the 'slap chop' style. Not the answer you're looking for? Browse other questions tagged equipment tomatoes or ask your own question.